It is hard to believe that we are at Spring Break. This is always a time that I realize that we do not have much time left with our students. It means the end of the 3rd quarter and the start of a very busy 4th quarter for your students. It means re-registration, celebrations, saying goodbye to old friends and hello to some new. Below are some dates save, some important assignments coming up, and some policies & procedures to remember. April 6.- Grade 7&8 ESL have TWO HUGE assignments due. April 7 – Moms & Dads class begins. 11:00 – 12:00 in room 202. April 19 – 3rd Quarter Report Cards go home / Parent –Teacher Conferences pm. 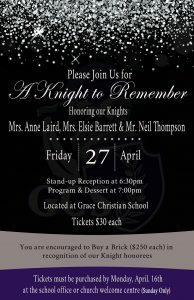 celebration of the significant contributions of Anne Laird, Elsie Barrett, and Neil Thompson throughout their years of service at GCS thus far. The event is taking place on Friday, April 27th starting at 6:30pm and tickets are $30 each. We hope to see you all out to show your support. Also, regular Seesaw practice EVERY day is also required… this ESL practice should not take longer than 50 minutes a day. We are an English speaking school. Students that do not respect this rule will be sent home immediately. Please remind your student at home about this important policy. Finally, do you have a family member that is interested in coming to GCS? Our classes are filling up quickly for the 2018 – 2019 school year, even with the building expansion. We try to accommodate every current family’s needs, please make sure you contact Doctor Huizing at Shuizing@gcspei.ca about the application process immediately.